The level of the Garden Route Dam is at 97,5% this week. GEORGE NEWS - The George Municipality intends on making a contractor appointment for the raising of the Garden Route Dam wall and spillway by the end of March, provided no appeals are received within the statutory 14-day appeal period after tenderers have been notified of the adjudication outcome. “After the many delays we have experienced, we are hopeful that we will have a contractor on site by the latest May 2018,” said Municipal Manager Trevor Botha. The completed raised dam wall and spillway will increase the storage capacity of the Garden Route Dam by about 25% to 12.5 million cubic metres, providing an overall increase of almost 11% to George’s total available raw water resources. In addition to the dam, George’s current raw water supply infrastructure includes the Kaaimans and Malgas river pumping schemes, an ultra-filtration plant and three equipped boreholes. The filtration plant and boreholes are considered alternative water sources for when, according to the Drought Management Plan, the Garden Route Dam level drops to below 80%. The municipality has completed the procurement processes and contractors that submitted valid tenders will be notified of the tender adjudication outcome shortly, after which a two-week appeal period applies. If there are no appeals the successful contractor should receive a letter of appointment by the end of March. After receiving a letter of appointment, the contractor must comply with certain contractual requirements - including a contract guarantee, insurance, health and safety plan and provisional programme - before any physical work can commence on site. The project includes the raising of the spillway (the spillway is the structure that releases flood water so that water does not overtop or even damage the dam wall) by 2,5 metres and the raising of the actual dam earth embankment wall by 1,5 metres. There are various works associated with these components including a concrete floor behind the spillway wall, additional rip-rap (the rocks packed against the dam wall to prevent water scour), rock anchors, and a drainage channel. The project will cost an estimated R25 million, of which R13.5 million was provided by the National Department of Water and Sanitation (DWS) in 2010. The George Municipality will fund the shortfall, but there have been engagements with the national department to increase its funding contribution to allow for real construction cost escalation since the initial funds were granted. Considering normal weather conditions, public and builders’ holidays and no major unforeseen circumstances, the construction period is estimated at 50 weeks to a year. Construction can go ahead with the dam at its current high level of 95%, but may require the use of a coffer dam as the construction of the spillway is directly affected. 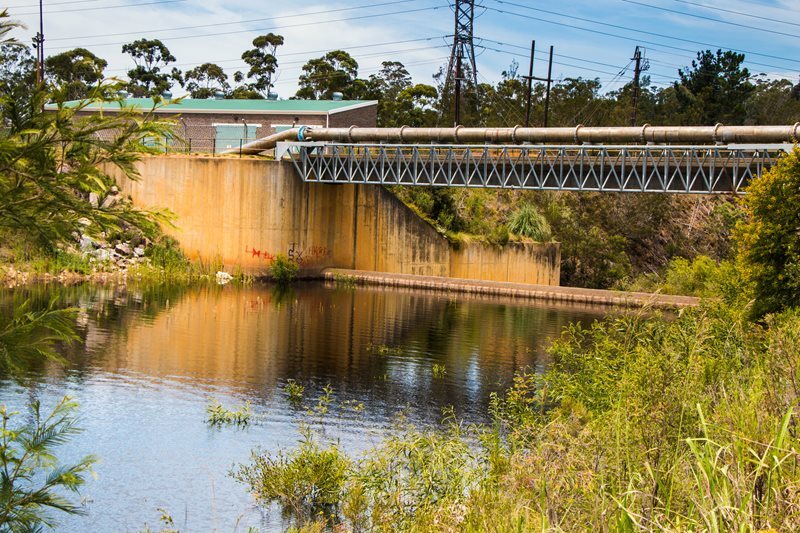 The raising of the Garden Route Dam spillway has been part of the George Municipality’s bulk raw water resource plan since it was finalised in 2006 to address the city’s short, medium and long-term needs. A water use licence (WUL) application was submitted to the national Department of Water and Sanitation as a priority project in December 2008, but was reprioritised during the 2009 drought when emergency drought funding made it possible to immediately implement two of the city’s other planned projects - the Malgas River Pumping Scheme and the Ultrafiltration Plant. Meanwhile, various legislative requirements delayed the licence until it was finally clarified in June 2015. Only once the WUL had been issued could the procurement process commence for the appointment of a dam engineer for this class of works - who in turn had to complete an extended design process. This process required additional approval in accordance with the DWS dam safety requirements and included a project model constructed according to the dam engineer's design. The proposed system also had to be modelled, before the final DWS approval was obtained - only then allowing the George Municipality to go ahead with the construction procurement, which is now being finalised. The level of the Garden Route Dam was measured at 97,5% this morning. Section 2b restrictions remain in place in George and surrounds until further notice. • Handheld watering of gardens using a hose and municipal water: even-numbered households Mondays and Thursdays, 19:00 - 21:00 AND uneven-numbered households Tuesdays and Fridays, 19:00 - 21:00. • Watering sports fields using municipal water is prohibited, except for golf course greens, bowling greens and cricket pitches, daily 19:00 - 21:00.